Yeah, I expect it will I've jsut been out of town for a couple of days and didn't have a spare handy at the time. 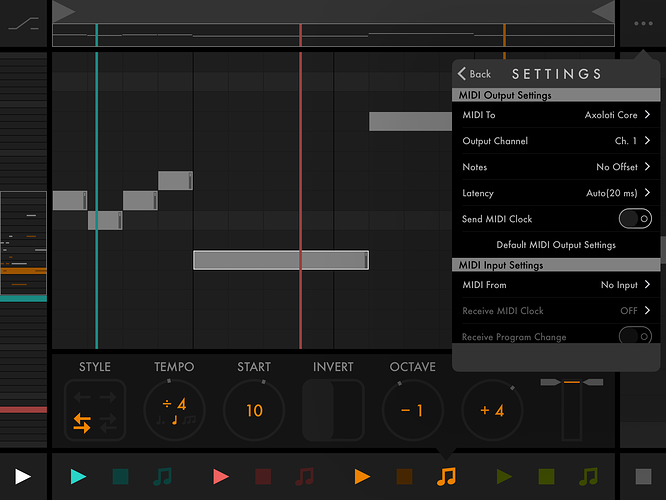 Just played with Fugue Machine, a multi-playhead sequencer for iPad. Works really well with polyphonic patches. The iPad is connected with the camera connection kit to the small USB port on the Axoloti. You can select the Axoloti Core in the MIDI Output settings. @thetechnobear It might be good to add an extra section in the first post with compatible iPad apps. really any iPad (iOS) app that uses core midi should work fine... I used thumbjam when I tested it. perhaps a separate topic... sounds more like a topic about iPad apps which are cool to use with Axoloti? Version 1.0.4 fixes support for USB-midi devices that have multiple interfaces, for example HID+MIDI, where the MIDI class is not the first interface. Akai MPK Mini MK2 was not recognized by 1.0.3 but now works with 1.0.4. Just tried the Akai EWI USB wind controller, it works perfectly, powered by the axoloti. and so does the Millenium MD-90 (cheap midi drum pads), but it needs it's own power supply(it the way it works). Novation Launchkey Mini mk2 works. Most of this controller are empty inside the case. Do you think an Axoloti could be housed inside of it? and make a few holes for the usb and jacks. In a Launchkey mini? Great idea but I don't think it's high enough. Pretty sure it's thinner than the Axo. Ive added firmware support for the Virus TI, for midi over USB (only midi, no audio), input and output both working. Kenton Control Freak Studio works without problems. Feeding power to the DC jack of Axoloti should help in that case. "No registered class for this device" means it is not usb-midi class compliant. I'd blame Yamaha, as there is little technical reason not to do class-compliant usb-midi. Use DIN midi instead. I just tested Waldorf Blofeld midi over usb and it works. @mrdrbobo did your check topic? or does Kenton Control Freak Studio has USB?? Oops you're right. Sorry for misposting. Kenton is din only.